Purpose Psychological capital is a set of personal resources comprised by hope, efficacy, optimism, and resilience, which previous research has supported as being valuable for general work performance. 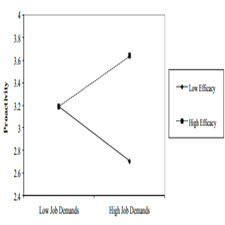 However, in today’s organizations, a multidimensional approach is required to understanding work performance, thus, we aimed to determine whether psychological capital improves proficiency, adaptivity, and proactivity, and also whether hope, efficiency, resilience, and optimism have a differential contribution to the same outcomes. Analyzing the temporal meaning of each psychological capital dimension, this paper theorizes the relative weights of psychological capital dimensions on proficiency, adaptivity, and proactivity ,proposing also that higher relative weight dimensions are helpful to cope with job demands and perform well. Methodology Two survey studies, the first based on crosssectional data and the second on two waves of data, were conducted with employees from diverse organizations, who provided measures of their psychological capital, work performance, and job demands. Data was modeled with regression analysis together with relative weights analysis. In order to face increasing complexity in organizations and perform effectively, employees need access to resources in the workplace (Demerouti, Bakker, Nachreiner, & Schaufeli, 2001; Karasek, 1979). Accordingly, psychological capital—a higher order construct denoting hope, efficacy, resilience, and optimism—represents a relevant set of personal resources to foster positive outcomes at work (Luthans, Youssef, & Avolio, 2007). Unlike individual differences supported as predictors of work performance, such as abilities and personality traits, psychological capital dimensions denote human strengths expressed in states that benefit desirable work outcomes. Supporting this, previous research has shown that psychological capital predicts work performance (Avey, Reichard, Luthans, & Mhatre, 2011) over and beyond individual differences such as conscientiousness, extraversion, and neuroticism (Avey, Luthans, & Youssef, 2010), adding thereby value for understanding performance in organizations. هدف سرمایه روانی مجموعه ای از منابع شخصی شامل امید، کارآیی، خوش بینی و انعطاف پذیری است که تحقیقات قبلی آن را به عنوان مفید برای عملکرد کار عمومی مورد حمایت قرار داده است. با این وجود، در سازمان های امروز، برای درک عملکرد کار، یک رویکرد چند بعدی لازم است، بنابراین ما با هدف تعیین اینکه آیا سرمایه روانشناختی را افزایش می دهد، مهارت، تطبیقی ​​و فعالیت، و همچنین اینکه آیا امید، کارآیی، انعطاف پذیری و خوش بینی، سهم اختلاف در نتایج مشابه این مقاله با تحلیل اهمیت زمانی هر ابعاد سرمایه روانشناختی، وزن نسبی ابعاد سرمایه روانشناختی بر مهارت، تطبیقی ​​و فعالیت را تئوری می کند و همچنین پیشنهاد می کند که ابعاد وزن نسبی بالاتر برای مقابله با خواسته های شغلی مفید باشد. روش شناسی دو تحقیق مطالعاتی، برای اولین بار بر مبنای اطلاعات crosssectional و دوم در دو موج داده ها، با کارکنان سازمان های گوناگون انجام شد که شاخص های سرمایه روان شناختی، عملکرد کار و خواسته های شغلی را ارائه می دادند. داده ها با تجزیه و تحلیل رگرسیون همراه با تجزیه و تحلیل وزن نسبی مدل سازی شدند. کارکنان به منظور افزایش پیچیدگی در سازمان ها و انجام کارآمد، نیاز به دسترسی به منابع در محل کار دارند (Demerouti، Bakker، Nachreiner، & Schaufeli، 2001؛ Karasek، 1979). بنابراين، سرمايه روانشناختی – ساختار بالاتر نظم، اميد، کارآمدی، انعطاف پذيری و خوشبينی – مجموعه مجموعه ای از منابع انسانی مربوط به تقويت نتايج مثبت در کار است (لوتنز، يوسف، وووولی، 2007). بر خلاف تفاوت های فردی به عنوان پیش بینی کننده عملکرد کارایی، مانند توانایی ها و ویژگی های شخصیت، به عنوان ابعاد سرمایه روان شناختی، نقاط قوت انسانی بیان شده در ایالت هایی که به نتایج مطلوب کار منجر می شوند، بیان می شود. حمايت از اين پژوهش پيشين نشان داده است که سرمايه روان شناختي عملکرد کاري (Avey، Reichard، Luthans، & Mathre، 2011) بيش از حد از تفاوت هاي فردي مانند وظيفه، اضطراري و روان رنجوري (Avey، Luthans & Youssef، 2010) در نتیجه برای درک عملکرد در سازمان ها ارزش می گیرد.